Joe Roberts from the Push to Change Foundation attended the Rotary Club of Brantford Sunrise September 9th. Joe tells a compelling story of his transformation from a Vancouver East side heroin addict, living out of a grocery cart, to MacLeans top 10 CEO. Next year he will be doing a Cross-Canada walk pushing a grocery cart in support of his Foundation, which assists street kids in making the same transformation as his. 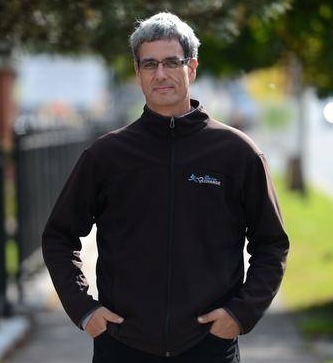 After having earned two sales and marketing diplomas in Ontario, Joe Roberts moved back to Vancouver in 1996 and accepted a position with Mindware Designs Communications in 1997. Joe Roberts led Mindware Design Communications to an 800% increase in business in less than four years, and the company now employs 15 people with Roberts as president and CEO. According to his partner and Mindware founder, Dr. Pesi A. Unwalla, it was Roberts's energy which drove the company's success over the past six years. "I transferred a lot of the skills I learned from hustling on the street and applied them to business," Roberts said in an interview with the Vancouver Province newspaper. "I'm very persistent and determined. I know how to take it on the chin to get things done."